Given the supernatural nature of folkloric vampires and their association with the shadows, it’s unsurprising that so many self-identifying vampires subscribe to occult philosophies or that a number of new religious movements build on their various ideas of vampirism. Although several distinct groups have claimed to offer the “one true vampire religion” and sorting through the details of each poses the challenges inherent in any attempt to grasp the finer points of a group whose practices are largely kept secret, familiarity with the basics of these groups is of interest to those seeking a deeper knowledge of vampire spirituality and history. While hardly an exhaustive list or a complete review of the groups listed, this summary of various traditions related to the vampire subculture may serve as a brief introduction to the history of some of the spiritual movements affiliated with or influencing the community of self-identifying vampires. While not addressing vampirism directly in its core teachings, according to Michelle Belanger’s Introduction in Vampires in Their Own Words, Crowley’s version of sexual vampirism taught at high levels of the OTO may have contributed to some of the practices and philosophical beliefs of modern vampires.¹⁸ Furthermore, the OTO certainly inspired later organizations in both structure and philosophy. LaVey had a bleak view of “psychic vampires” which he defined in The Satanic Bible as “individuals who drain others of their vital energy” and which he went on to describe as emotionally manipulative.²³ The later statement, however, that “the Church of Satan does respect and appreciate” the Temple of the Vampire²⁴ supports the view that LaVey used the term “psychic vampire” to refer to people who engage in the unsavory behavior he described rather than those who actually identify as vampires or who practice vampirism as a sincere spiritual path. Led primarily by Goddess Rosemary and founded in 1976, the group that would eventually come to be known as Temple House Sahjaza was initially a female-only coven³⁴ for vampyric witches³⁵ called the Black Rose Coven,³⁶ became the Z/n (Zenith/nadir) Society NYC in 1985,³⁷ and formally became House Sahjaza in 1998.³⁸ House Sahjaza is non-denominational and open to all genders and members are encouraged to explore their own spiritual paths.³⁹ While Sahjaza members practice diverse spiritual beliefs, they reserve their core teachings for those initiated into the House and all members share a common code of ethics.⁴⁰ Although many of their practices are only shared with the initiated, House Sahjaza is known for its rituals involving donor blood.⁴¹ One notable former member of House Sahjaza was Father Sebastiaan⁴² who would go on to found the OSV. While the Sanguinarium’s beginnings may not have included a majority of need-based vampires, Joseph Laycock describes it as a sort of “midwife” of the modern vampire subculture, comparing it to the legacy of the Hermetic Order of the Golden Dawn’s influence on later occult organizations.⁵⁸ The Sanguinarium, despite criticisms by self-identifying vampires regarding the prominent inclusion of vampire lifestylers, was a useful network of websites, businesses, organizations, and general resources that allowed vampires to connect, compare notes, and organize events.⁵⁹ Various vampire groups were invited to join the Sanguinarium umbrella as Houses,⁶⁰ further facilitating the exchange of information and other resources among self-identifying vampires. Not all organizations founded by and for self-identifying vampires are fundamentally religious or spiritual in nature, as evidenced by the VVC, founded in 2006. The VVC includes at the time of this writing 130 members (three in memoriam) coming from over 15 countries around the world. With a diverse membership including psi-vampires, sanguine vampires, and donors, the VVC works with academia, general media, and law enforcement to provide reliable information and dispel misconceptions about self-identifying vampires. Drawing from this wide pool of contributors, who who were nominated and elected by existing VVC members based on their contributions to the vampire community, the VVC also works to facilitate cooperation and the constructive exchange of ideas and experiences among the community’s leaders without establishing a centralized governing body or imposing a single view of vampirism upon others.⁸² Although the VVC seeks to ease access to resources for the greater vampire community much as the Sanguinarium once did, the VVC does not require its members or those to whom it offers assistance to conform to any set of beliefs or to participate in any rituals. The central text of the Kemetic Order of Aset Ka, the Asetian Bible, was published by Luis Marques in 2007⁸³ although the Order claims ancient, even prehistoric origins.⁸⁴ The Order seems to be based in Oporto, Portugal⁸⁵ and the Asetian Bible’s author states that the text was “developed between Portugal and Egypt”.⁸⁶ Adherents of the teachings of the Asetian Bible practice a magickal tradition believed to be created and passed down by the Egyptian goddess Aset,⁸⁷ also commonly known as Isis,⁸⁸ with the goal of achieving higher states of consciousness and general spiritual evolution through energy manipulation.⁸⁹ Asetians strive to achieve this empowered state in part by uncovering their own past lives, dating back to ancient Egypt, thus proving to themselves their own spiritual immortality.⁹⁰ The Order of Aset Ka encourages not only personal attainment of godhood, but the acknowledgment of an external deity, Aset, as well,⁹¹ not unlike the ToS’s relationship with Set. In addition to individual occultists carrying their experiences with past organizational affiliations with them into new orders and a majority of those orders explored above disavowing the greater vampire community in general and sanguinarians in particular, one key element frequently arose in many of these orders, namely Kemeticism. Joining an order or subscribing to the philosophy or religion of another group is by no means a requirement for self-identifying vampires. According to a 2007 survey by Suscitatio Enterprises LLC, a strong majority of members of the modern vampire community, 75.82%, are unaffiliated with any formal vampire organization.¹¹² These vampires are often referred to within the community as “Ronin”.¹¹³ During the early years of the Sanguinarium, Courts—collections of Houses and other vampire groups geographically close to each other that would regularly exchange information and socialize¹¹⁴—shunned Ronin and did not allow them to participate in Court activities including voting on issues that could impact all members of the local community, including Ronin.¹¹⁵ Ronin gradually became more accepted within the Court system in light of the invaluable contributions of individual Ronin to the establishment of New Jersey’s Court of the Iron Garden.¹¹⁶ One of those Ronin who blazed a trail for the inclusion of interested Ronin in Court activities, Madame X, went on to found House of the Dreaming, a “House of Ronin” that recognizes the value of Family as well as the importance of individuality and diversity, in 2000 with Vailen Moon.¹¹⁷ The House of the Dreaming certainly does not represent or include every otherwise unaffiliated member of the vampire community﹘most, after all, prefer to avoid associating with any formal vampire organization﹘and prides itself on carefully selecting its members.¹¹⁸ With the rise of the online vampire community (OVC), Ronin now have as strong a voice as any other member of the OVC. As of March 15, 2011, Suscitatio Enterprises, LLC’s Vampire Community History Project included entries for 371 groups related to the vampire community.¹¹⁹ The small number explored here included those who identify as vampires because their souls are non-human, their chakras were altered many lives ago, they want to avoid the Second Death, or they just have some fundamental, perspective-shifting need that can only be met by donations from others and they may have no clue why. Clearly there are many ways to be a vampire and to express one’s experiences as such, and it’s no surprise that navigating the broader community can pose a challenge for newcomers and long-established participants alike. As the histories of these groups demonstrates, however, even those who vehemently disagree with the views of those who came before often draw inspiration from prior organizations’ ideas and work to fill needs revealed by the perceived shortcomings of past groups. Familiarizing oneself with the many forces that have shaped the modern vampire community is an important early step in determining how best to contribute something meaningful to it. Even when breaking entirely new ground, it’s helpful to learn from those with experience in laying foundations. Hermetic Fellowship, The Historical Background of Hermeticism, March 20, 2014, http://www.hermeticfellowship.org/HFHer ... Background (accessed May 8, 2016). Hermetic Fellowship, The Beliefs of Hermeticism, March 20, 2014, http://www.hermeticfellowship.org/HFHer ... efs&Values (accessed May 8, 2016). Steven R. Cranmer and Albert Billings, A Brief History of the Golden Dawn, http://hermetic.com/gdlibrary/gd-faq.html#gdfaqII (accessed May 8, 2016). Steven R. Cranmer and Albert Billings, What connection did Aleister Crowley have with the Golden Dawn?, http://hermetic.com/gdlibrary/gd-faq.html#gdfaqI08 (accessed May 8, 2016). Steven R. Cranmer and Albert Billings, Who was Israel Regardie?, http://hermetic.com/gdlibrary/gd-faq.html#gdfaqI07 (accessed May 8, 2016). Flying Rolls, http://www.hermeticgoldendawn.org/flyin ... ction.html (accessed May 8, 2016). V. H. Frater Resurgam, Flying Roll V: Thoughts on Imagination, http://www.golden-dawn.org/gd_fr5.htm (accessed May 8, 2016). Brian Haughton, Dion Fortune - In the Golden Dawn Tradition, http://www.mysteriouspeople.com/Dion_Fortune.htm (accessed May 8, 2016). Dion Fortune, Psychic Self-Defense, 25-28, http://jacquesricher.com/occult/psychic.pdf (accessed May 8, 2016). Sabazius and AMT, O.T.O. Under Crowley, http://oto-usa.org/oto/history/#crowley (accessed May 8, 2016). Sabazius and AMT, History, http://oto-usa.org/oto/history/ (accessed May 8, 2016). US Grand Lodge Ordo Templi Orientis, Theology, http://oto-usa.org/thelema/theology/ (accessed May 8, 2016). Michelle Belanger, ed., Vampires in Their Own Words: An Anthology of Vampire Voices, “Introduction” (Woodbury, MN: Llewellyn Publications, 2007), xix. United States Army, “Religious Requirements and Practices of Certain Selected Groups. A Handbook for Chaplains,” extracted from Department of the Army Pamphlet No. 165-13 (1978), http://www.churchofsatan.com/doa-pamphlet-no165-13.php (accessed May 14, 2016). Eugene Robinson, “Anton LaVey,” Birth of Tragedy, no. 4 (November 1986 - January 1987), http://www.churchofsatan.com/interview- ... ragedy.php (accessed May 8, 2016). Blanche Barton, Church of Satan History: The Church of Satan, http://www.churchofsatan.com/cos-church-of-satan.php (accessed May 8, 2016). Church of Satan, F.A.Q. Fundamental Beliefs, http://www.churchofsatan.com/faq-fundam ... eliefs.php (accessed May 8, 2016). Anton Szandor LaVey, The Satanic Bible (New York: Avon Books, 1969), 56-60. Church of Satan, Satanic Sources - Societies, http://www.churchofsatan.com/sources-societies.php (accessed May 8, 2016). Peter H. Gilmore, Pretenders to the Throne: Regarding the Temple of Set, http://www.churchofsatan.com/pretenders ... throne.php (accessed May 8, 2016). Gabriel Roberts, The Devil’s Advocate: An Interview with Dr. Michael Aquino, http://disinfo.com/2013/09/devils-advoc ... el-aquino/ (accessed May 8, 2016). Temple of Set, General Information and Admissions Policies, https://xeper.org/pub/pub_gil.html (accessed May 8, 2016). United States Army, “Temple of Set” in Religious Requirements and Practices of Certain Selected Groups. A Handbook for Chaplains (2002), 13, http://alleeshadowtradition.com/pdf/arm ... ndbook.pdf (accessed May 16, 2016). Temple of Set, Structure: Temple Fuctions, https://xeper.org/pub/pub_structure.html#orders (accessed May 8, 2016). Lilith Aquino and William T. Butch, Order of the Vampyre, https://xeper.org/ovampyre/ (accessed May 8, 2016). Joseph Laycock, Vampires Today: The Truth About Modern Vampirism (Westport, CT: Praeger Publishers, 2009), 112. Temple House Sahjaza’s Facebook page, https://www.facebook.com/TempleHouseSahjaza/info/ (accessed May 8, 2016). Goddess Rosemary, “Temple House Sahjaza,” in Gotham Vampyre Archives: The Anthology, 2nd edition, eds. Lord Shaolin Asura-MacPhee and Sir Traveler P. Asura-MacPhee (Pro Rege Productions, 2014), 74. Tony Sokol, “Daily Offbeat Vampire House Profile: Temple House Sahjaza, an Exclusive Interview with Goddess Rosemary,” Daily Offbeat, October 31, 2014, https://thegraveyardpress.wordpress.com ... -off-beat/ (accessed May 8, 2016). Sokol, “Daily Offbeat Vampire House Profile: Temple House Sahjaza, an Exclusive Interview with Goddess Rosemary,” https://thegraveyardpress.wordpress.com ... -off-beat/ (accessed May 8, 2016). Jerico DeAngelo, “Goddess Rosemary - Mother High Priestess - Temple Sahjaza.” YouTube video, 9:23. Posted August 30, 2014. https://youtu.be/1jVksJw0mLY (accessed May 8, 2016). John Edgar Browning, “Temple of the Vampire,” in The World Religions and Spirituality Project (2011), https://www.academia.edu/17631703/_Temp ... niversity_ (accessed May 8, 2016). Temple of the Vampire, History of the Temple, http://templeofthevampire.com/?page_id=19 (accessed May 8, 2016). Temple of the Vampire, The Vampire Creed, http://templeofthevampire.com/?page_id=186 (accessed May 8, 2016). LaVey, The Satanic Bible, 25. Temple of the Vampire, The Vampire Bible, “The Calling of the Undead Gods” (Temple of the Vampire, 1989). Temple of the Vampire, The Vampire Bible, “The Secret Methods of Vampirism” (Temple of the Vampire, 1989). Temple of the Vampire, Legal, http://templeofthevampire.com/?page_id=962 (accessed May 8, 2016). Temple of the Vampire, The Vampire Bible, “The Coming Apocalypse” (Temple of the Vampire, 1989). Lord Shaolin Z. Asura-MacPhee, Lord “O” MacPhee Orion, and Lord Wolf Malkavia, “Clan Sabretooth: History and Traditions of the Gotham Halo Vampyre Community,” in Gotham Vampyre Archives: The Anthology, 2nd edition, eds. Lord Shaolin Asura-MacPhee and Sir Traveler P. Asura-MacPhee (Pro Rege Productions, 2014), 14. Michelle Belanger, The Psychic Vampire Codex, with a foreword by Father Sebastiaan (San Francisco, CA: Weiser Books, 2004), xii. Sanguinarius, Terminology and Lingo, http://www.sanguinarius.org/terminology/#Sanguinarium (accessed May 8, 2016). Suscitatio Enterprises, LLC, Real Vampire Community Resource & Link Directory (2011), 21, http://www.suscitatio.com/RealVampireCo ... ay2011.pdf (accessed May 16, 2016). Belanger, Psychic Vampire Codex, 32. Michelle Belanger, Our Stance on Reincarnation, http://kheperu.org/stance-reincarnation/ (accessed May 8, 2016). Father Sebastiaan, Vampyre Sanguinomicon: The Lexicon of the Living Vampire, with a foreword by Konstantinos (San Francisco, CA: Weiser Books, 2010), 48-49. Michelle Belanger, The Foundation of the Kherete, http://kheperu.org/foundation-kherete/ (accessed May 8, 2016). Michelle Belanger, Who We Are, http://kheperu.org/who-we-are/ (accessed May 8, 2016). Belanger, Psychic Vampire Codex, xii. Michelle Belanger, Kheperu and the Temple of Set, http://kheperu.org/kheperu-temple-set/ (accessed May 8, 2016). Belanger, Psychic Vampire Codex, 263. Father Sebastiaan, Vampyre Sanguinomicon, 203. Father Sebastiaan, Vampyre Magick: The Grimoire of the Living Vampire, with a foreword by Michael W. Ford (San Francisco, CA: Weiser Books, 2012), xviii. Father Sebastiaan, Vampyre Sanguinomicon, 49. Father Sebastian, Three Different Types of Vampires, http://www.sanguinarium.net/index.php?t ... tiaan.125/ (accessed May 5, 2016). Father Sebastiaan, Vampyre Sanguinomicon, 45. Voices of the Vampire Community, Voices of the Vampire Community, http://www.veritasvosliberabit.com/vvc.html (accessed on May 12, 2016). Kemetic Order of Aset Ka, Asetian Bible, http://www.asetka.org/AsetianBible.shtml (accessed May 8, 2016). Kemetic Order of Aset Ka, Tradition, http://www.asetka.org/tradition.shtml (accessed May 8, 2016). Suscitatio Enterprises, LLC, Real Vampire Community Resource & Link Directory (2011), 32, http://www.suscitatio.com/RealVampireCo ... ay2011.pdf (accessed May 16, 2016). Joyce Tyldesley, “Isis,” in Encylopaedia Britannica, http://www.britannica.com/topic/Isis-Egyptian-goddess (accessed May 8, 2016). Kemetic Order of Aset Ka, Vampirism, http://www.asetka.org/vampirism.shtml (accessed May 8, 2016). The Dark Nations’ Facebook page, https://www.facebook.com/TheDarkNationsPublicPage/info (accessed May 16, 2016). Yami Hikari, The Quarterly, March 2011, http://houseofthedreaming.org/reports/032011.htm (accessed May 16, 2016). The Dark Nations, Brethren List - 2014, https://www.facebook.com/notes/851133978235130/ (accessed May 16, 2016). Hikari, The Quarterly, March 2011, http://houseofthedreaming.org/reports/032011.htm (accessed May 16, 2016). Father Sebastiaan, Vampyre Magick, 28. Don Webb, Xeper: The Eternal Word of Set, https://xeper.org/pub/pub_dw_xeper.html (accessed May 8, 2016). Belanger, Psychic Vampire Codex, 31. Father Sebastiaan, Vampyre Sanguinomicon, 21. Kemetic Order of Aset Ka, The Order, http://www.asetka.org/order.shtml (accessed May 16, 2016). “Ankh,” in New World Encyclopedia, http://www.newworldencyclopedia.org/entry/Ankh (accessed May 8, 2016). 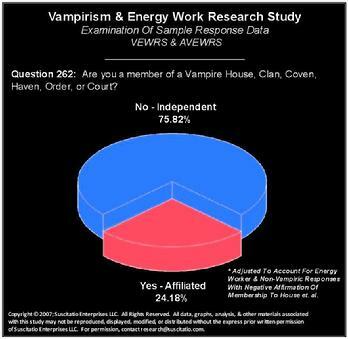 Suscitatio Enterprises LLC, “Question 262: Are you a member of a Vampire House, Clan, Coven, Haven, Order, or Court?” in Vampirism and Energy Work Research Study: Examination of Sample Response Data (2007), http://www.suscitatio.com/images/348_262GraphNegUR.jpg (accessed May 8, 2016). Belanger, Psychic Vampire Codex, 256. Tony Sokol, “Daily Offbeat Vampire House Profile: House of the Dreaming, An Exclusive Interview with Madame X,” Daily Offbeat, December 6, 2015, https://deyliveaccestv.wordpress.com/20 ... adame-x-2/ (accessed May 8, 2016). Madame X and Trismegistus, The New Jersey Iron Garden, Reclaiming the Flame that Nourishes the Seeds, https://www.facebook.com/notes/madame-x ... 6398639491 (accessed May 8, 2016). Sokol, “Daily Offbeat Vampire House Profile: House of the Dreaming, An Exclusive Interview with Madame X,” https://deyliveaccestv.wordpress.com/20 ... adame-x-2/ (accessed May 8, 2016). Suscitatio Enterprises, LLC, Vampire Community History Project, http://www.suscitatio.com/projects/vamp ... oject.html (accessed May 12, 2016).